Prior To 1968, Telephones Didn’t Have? If you’ve used an automated phone service recently, it may have prompted you to “enter your nine digit account number followed by the pound key” to signal the system that you had completed the task and entered the full string of numbers. Not only would you not be greeted with such an automated system when you called your bank back in the 1960s, but prior to 1968, the pound key (and the star key) didn’t exist. Prior to that date, rotary and push button telephones simply had the numbers 0 through 9 on them. Each of the ten keys corresponded to a tone (a combination of two sounds that distinctly identified each number versus potentially similar sounding background noise) in the touch-tone phone system. In the late 1960s, AT&T decided to add two additional keys (and thus two additional tones), labeling them with the * and # symbols. At the time, there was no prescribed or applied use for the keys, but the researchers at AT&T had an if-we-build-it-they-will-come attitude about it and understood that there was no reason not to include additional keys when someone would likely find a use for them in short order. 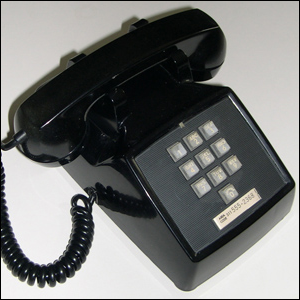 By the early 1980s, both keys were in active use and not only became a part of automated dialing systems, but were integrated into the star dialing codes (known formally as “vertical service codes”) such as *69 to return the last incoming call. Image courtesy of the Telephone Archive.